Walkability is one of those urban planning buzzwords that sounds good in theory but may leave you wondering if it is only a pipe dream. Consider it good news that we have found two places where it exists for real — one is an established neighbourhood in downtown Toronto and the other is the Town of Whitby. Yorkville is obviously one of the most appealing neighbourhoods in Toronto — a walker’s paradise and apparently it will get even more walkable with the arrival of 8 Cumberland “which will create a new gateway to the Yorkville District,” says its developer. 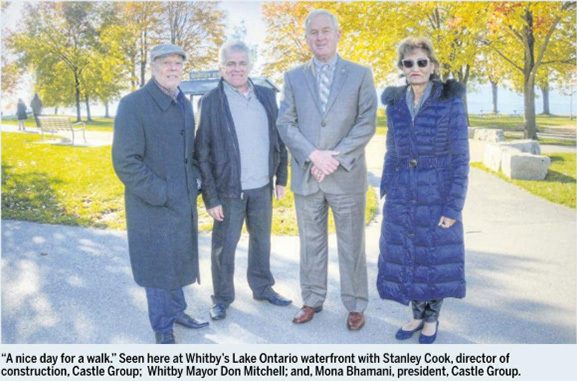 When it Comes to walkable communities, however, there may be nobody more ambitious in planning for it than the Town of Whitby, just east of Toronto, which visited this past Tuesday. called Harbour Ten10 with occupany scheduled for 2020. The developer commits to healthy living not just in terms of its on-site amenities, but offering easy access to the area’s parks and trails. day morning and stroll along the boardwalk at Heydenshore Park. which runs along Lake Ontario. of “walkability” already built in. Joining us also is Whitby Mayor Don Mitchell, who happens to be a of ‘walkability champion,’ so much so, he is making it key to planning for Whitby’s growth. Walkable Cities. and a just released companion title called Waiknble City Rules: 101 Steps Making Better Places, is a set of practical steps that addresses everything from how to sell walkability. to making great sidewalks. to designing roads and biking lanes. and to allow for adequate parking. north to its south, and to link all of its natural areas. and Oshawa to the east. and completely accessible to the public. Area, the Iroquois park Sports Centre, and the new Cullen Central Park where pickleball and bocce ball courts, and a dog park are being added. already creating quite the buzz. With all these developments, this a good time to think about the future — Whitby is expected to grow by 65,000 more residents in the next 20 years. Good to see that ‘walkability’ is at the centre of its plans.